I presented this talk at the Sixteenth Century Society Conference in San Juan on October 24, 2013. You can read the full text of the paper here. The Mira calligraphiae monumenta is one of the most intriguing objects of the kusntkammer of Rudolf II. The creators of this layered work never met each other; Georg Bocskay, secretary for Ferdinand I, penned the manuscript’s calligraphic displays in 1561-2, while Joris Hoefnagel was commissioned by Rudolf three decades later to illuminate this treasure with brilliantly rendered flora and fauna. 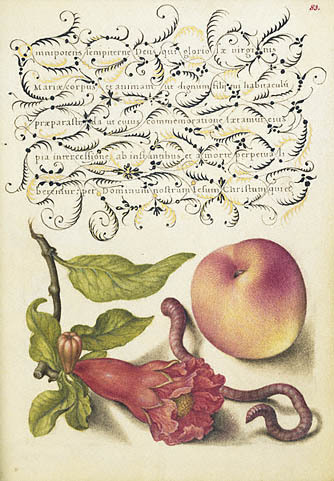 It has been argued that Hoefnagel’s additions establish a paragone between the painted image and the written word, his illusionistic naturalia surpassing Bocskay’s page-bound artificialia. It has been further argued that the outcome of this paragone reflects a Paracelsian philosophy shared by the Rudolfine court: that true knowledge can only come from natural investigation and not from secondary texts. However, this interpretation elides the complexities of magical and occult studies in Prague. The diverse schools of occult thought entertained at the Rudolfine court also included that of Heinrich Cornelius Agrippa, who believed inscribed signs had the capacity to become sigils endowed with power over the natural world. I argue that the complex formal interplay of text and image on certain pages of the MCM at times suggests that Bocskay’s scripts indeed hold sway over Hoefnagel’s natural objects. This suggests that even as Rudolf and his court appreciated the MCM for its aesthetic beauty and inventiveness, these semiotically-intelligent readers must also have related its formally-cohesive tableaus of text and nature to sixteenth-century occult notions of the physical power of the inscribed sign investigated in their own court. Lincoln, Matthew D. "Presenting at the Sixteenth Century Society Conference." Matthew Lincoln, PhD (blog), 05 Aug 2013, https://matthewlincoln.net/2013/08/05/presenting-at-the-sixteenth-century-society-conference.html.